I make my living with words but today I find it difficult to express just how great Indian Creek Youth Camp really was this year. Clark Sims begins planning this week at least 6-8 months in advance. He has handpicked a staff of assistants and counselors that is second to none. At 252 campers, this is the largest week during the camp season. This year, 29 young people put on their Lord in baptism and another 25 rededicated their lives to Christ. Among those responding were our own, Anna Isenhower and Travis Purser who were both baptized into Christ. Anna Lloyd asked for prayers and was restored. Our activities included a thorough study of Colossians with speakers each morning and each evening taking a passage from the book for their text. Campers studied Colossians in age-divided classes and in their teams in preparation for Bible bowl. Teams participated in sporting activities and in wacky games. Congratulations to TEAM ANDY for their victory in the team competition. Some underestimate the importance of Christian camping. As part of a year-long youth strategy, a week at camp will stand as one of the greatest moments in any child’s life. Lifelong friendships are established at camp and are renewed year after year. Many campers will stay in touch with each other throughout the months. 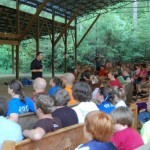 Camp allows a youthful network to build. By weeks end we were all tired and dirty but were renewed in our faith. Next year will be even better as we build on our record-setting year. Thanks to all the staff and to those parents who took vacation time to make this a great week. Planning for next year begins soon. Tell us what you think about camp!